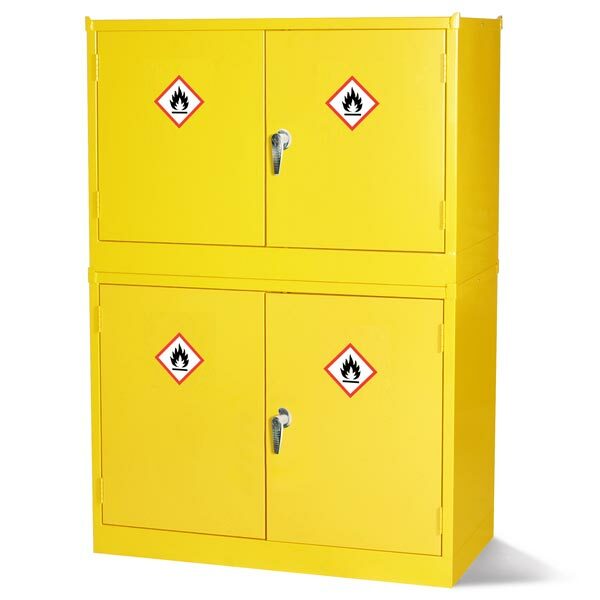 Hazardous Substance Stackable Cabinet - 1 Shelf. 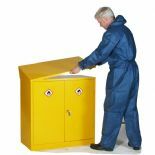 These robust metal chemical storage cabinets have been designed to offer good structural stability and safely contain spillages within the cabinets leak proof sump. Suitable for the secure storage of chemicals, paints, solvents and dangerous substances as classified by CHIP and the new CLP regulation. Conforms to Health & Safety Executive Guide HSG51 and DSEAR 2002. Best Practice… Cabinets supplied without removable sumps. Extracting a heavily laden sump is both difficult, dangerous and unsafe....risks contamination from the contents of the sump onto operatives. Cabinets manufactured with integral leak-proof base sump. Spillages should be removed with use of a suitable absorbent material or siphon pump. Specification: Manufactured using high quality steel 0.7mm - 1.5mm for extra rigidity and to maintain structural integrity under extreme conditions. Doors are reinforced with steel door stiffeners. Welded leak proof base sump. Supplied with adjustable shelves. Sloping tops and stands available. Powder coated paint finish. Mastered locks supplied with 2 keys. These products are not fire proof. In accordance with HSE guidelines and regulations, before these cabinet are placed into operational use, it is the responsibility of the user to ensure that : the signage to be displayed on this cabinet is appropriate to the hazards associated with those chemicals or products to be stored within. Anti-bacterial powder coating an effective solution to fight against bacterial contamination for the life of the coating. Independently tested and found to be 99.9% effective against MRSA and E-coli. Also shown to exhibit zero growth for fungi and moulds. elite GUARD offers the healthcare, food and those users requiring stringent hygienic environments an effective secondary support to existing cleaning practices in the fight against bacterial contamination. In reflecting the needs of businesses that demand a low carbon economy by improving the environmental credentials of products that are used every day... We can announce that all of their single-to-eight door lockers and five-to-fifteen door garment dispensers now contain Abbeysteel™ Sustainably Sourced Steel, a unique raw material that can show a significantly reduced carbon footprint on the products that contain it and the businesses that use it.